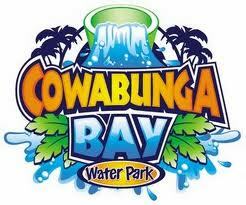 Cowabunga Bay is a family friendly water park with waterslides and fun for all ages. 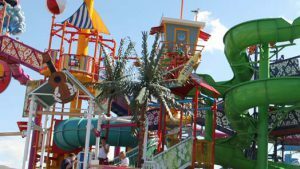 Attractions include the signature Cowabunga Splash six-story, 225 foot long play structure with nine water slides and more than 300 interactive features beneath 2 tipping buckets. For thrill-seekers, the park has Bonzai a fast-paced body slide with quick turns and drops and Mondo a totally enclosed high-speed slide. For children, there is a dual-lane racing slide, plus open and enclosed body slides. When it's time to relax, the Cowabunga River is a 400-foot lazy river you can ride while floating in tubes and there is also a beach to soak up the sun. Other Specials & Coupons To view Cowabunga Bay Water Park Admission Tickets, other Specials and Coupons, go to their special page by clicking here. Cowabunga Bay Water Park updates this page throughout the year, so check back to see if new specials and coupons have come in. Note to our visitors Cowabunga Bay Water Park coupons and specials can change without notice. So please visit their official website to make sure of the latest pricing and coupons.